FAMILY OR CLASS REUNIONS - TWO OPTIONS. . .
Option one: Each attendee gets a copy. When this option is selected your Columbus event photographer will photograph the reunion attendees as a large group. A 5”x7” or 8”x10” class picture will be made for each person photographed. These pictures will be made on site and delivered immedaitely. The price for this service is $8.00 for each 5x7 with a minimum order of 20 copies. The price for this service is $12.00 for each 8x10 with a minimum order of 20 copies. Option two: We take a count. 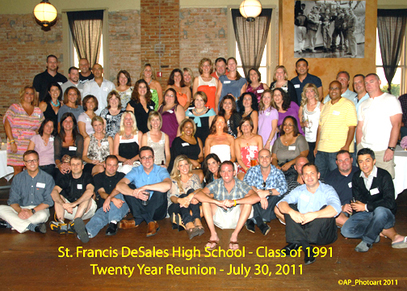 When this option is selected your Columbus event photographer will photograph the reunion attendees as a large group. A count will be made after the picture is taken and a 5”x7” or 8”x10” class picture will be made for each person who requests one. The images will be made and delivered on site immediately. The price for this service is $10.00 for each 5x7. No minimum required. The price for this service is $15.00 for each 8x10. No minimum required. A retainer of one hundred dollars ($100.00) is required to reserve your date for photography. Your retainer will be refunded at the time and location of photography when you select "option one (above)." When each individual is paying for the photography, (option two above), the retainer will be refunded when sales are greater than or equal to the amount of the retainer. When you retain an event with us we are blocking off a space on our calendar that will go to no one else. If you should find it necessary to cancel our services, we cannot refund your retainer, but will do our best to accommodate you in a future reservation. Should we be able to re-contract the date we will consider refunding your retainer.